The Norfolk Gypsy is a 20′ gunter rigged yacht with a high peaked gaff. Considerable use of traditional brass, bronze and galvanised steel fittings, hardwood for exterior trim, oak and teak for interior trim and spruce spars combine together with the use of best quality resins, glass fibre and gelcoat (all hand laid) to produce a very low maintenance and immensely seaworthy yacht. She is equally suitable for exploring shallow tidal estuaries as for longer coastal passages in testing conditions. 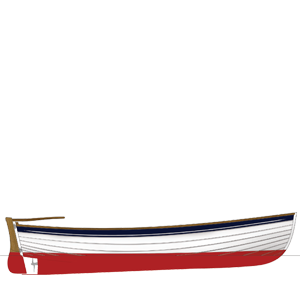 Her shallow draught and bilge runners also enable the boat to be beached without excessive heel. 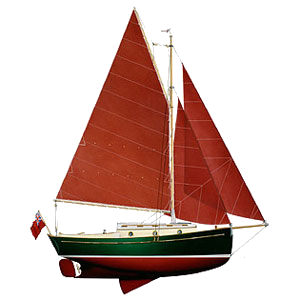 To ensure stability, the Norfolk Gypsy combines heavy construction with internal ballast and a firm turn of the bilge. The modest high peaked gaff (gunter) rig has been designed to give excellent performance in both light airs and stronger winds and is easily handled in rough weather. 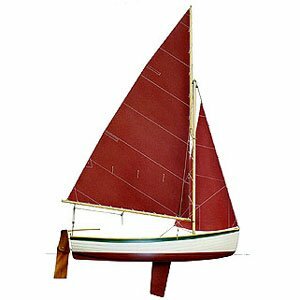 The use of the high-peaked gaff is that the light weight and flexible gaff tends to bow around the halyard attachment point when the wind gusts, automatically flattening the sail at just the right time. Also, by tweaking the peak halyard, you can (although you don’t have to) produce very effective sail shape adjustments when changing point-of-sail, or during varying wind conditions. 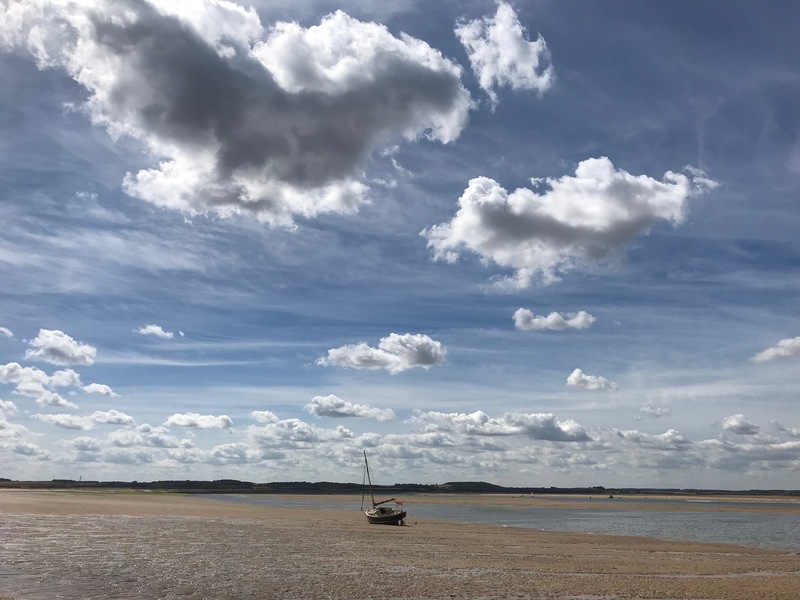 (To flatten the sail in strong winds or to loosen the leach in light aires) The high-tech racing boats spend hundreds of thousands doing this with carbon-fibre and stainless steel – here we do it (in a cruder, but effective way) using spruce spars and polyester line. The simple slab reefing system for the mainsail and the roller reefing system for the genoa provides fast and efficient reefing. The mainsail has been carefully cut to maximise windward performance. 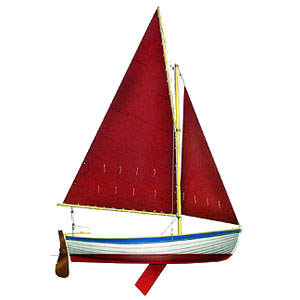 The Norfolk Gypsy can also be sailed on either mainsail or jib alone. The centreboard is lowered and raised with a very high purchase drum winch – the control rope being led into the cockpit for ease of handling by the helmsman. All deck surfaces have a moulded non-slip surface for safe working and the cabin top is fitted with ‘Treadmaster’ non-slip material. The forward deck has been lowered to provide a safe working area when handling the anchor. In this area there is a substantial wooden sampson post for mooring. The cabin employs a conventional V-berth layout with the galley and WC aft., close to the main hatch. 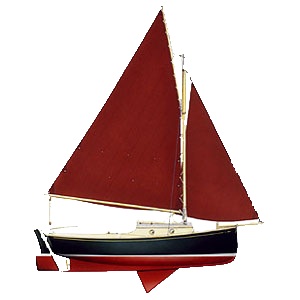 The deckhead of the cabin is constructed in balsa sandwich GRP. The cabin interior is fitted out in oak and teak with a white fibreglass cabin liner which incorporates the berths, galley, lockers etc. There are 6 brass port lights at eye height providing light and vision to both sides of the cabin and forward. The two forward port lights are opening to provide excellent ventilation throughout the cabin. For auxiliary propulsion, the Norfolk Gypsy has the option of either an inboard diesel engine, a Yanmar 10 HP diesel, installed beneath the bridge deck, or an outboard engine mounted in a well at the aft end of the cockpit. Access to the inboard engine is under the hinged step over the engine with space for maintenance when required. The boat has been designed specifically to be trailerable and is very easy to launch and recover. The Norfolk Gypsy can be found in waters all over the world.